No one enjoys having a sore throat. Sometimes, you wake up one morning with a slightly sore throat. Before long, your glands are swollen and a fever starts. You have some type of infection like strep throat, the flu or a cold. These can lead to symptoms like fatigue, body aches, headaches and coughing. If you do have strep throat, antibiotics can help the infection to clear up in just a few days. Meanwhile, a virus will generally take at least two to seven days to start to heal. If you have a sore throat and swollen glands without a fever, you may start to worry. A fever is a sign of an infection. Without a fever, you may not know what is causing your sore throat to happen. You may not have any other symptoms, and the sore throat seems to hang around for days. If you are worried about this condition, then it is time to find out some of the potential causes. 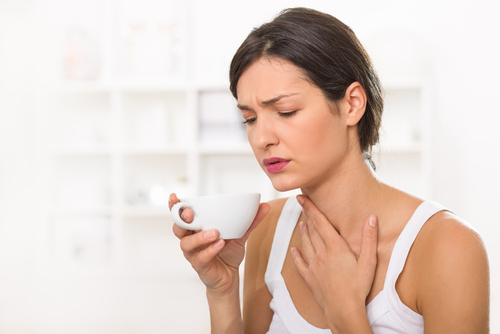 What Causes a Sore Throat, Swollen Glands and No Fever? When you have swollen glands, it is because of your lymph nodes. Your lymph nodes are normally responsible for supporting your immune system. They activate whenever you have an infection to clean out the bacteria and virus. These lymph nodes are located all over your body and are pretty easy to feel. If they become swollen, they can even double in size. Within the fluid in your lymph nodes are water, white blood cells, protein and fat. As blood starts to filter through the lymph nodes, it gathers up cancerous cells and infections that have to be destroyed. Whenever your lymph nodes are fighting cancer or an infection, they will swell. Swollen or painful lymph nodes are known medically as lymphadenopathy. If you have a sore throat and swollen glands, you may just have some type of mild virus. You may also have other symptoms like a cough, fatigue or a runny nose. If you do not have any other symptoms and your current symptoms do not heal in about a week, you should go to your doctor to be checked out. While you will often have a fever when your immune system is fighting an infection, this is not always the case. You could still have the flu or a cold. You may also have tissue or skin that is infected near where the swollen gland is located. In some cases, your swollen glands and sore throat could be a sign of conditions like Hodgkin’s lymphoma, HIV, mononucleosis, leukemia, non-Hodgkin’s lymphoma or tuberculosis. Swollen glands and a sore throat could be due to tuberculosis. This bacterial infection first infects the respiratory system before spreading to your lymph nodes and the rest of your body. This highly contagious disease can cause symptoms like blood in your sputum, night sweats, fatigue, coughing and weight loss. It is treated with antibiotics and quarantine. Your lymph nodes may even have to be removed in extreme cases. Mononucleosis is caused by a virus. It tends to cause a sore throat, but does not always cause a fever. If you are infected with mono, your lymph nodes may swell. You may also experience symptoms like abdominal pain, swollen lymph nodes, dizziness, extreme fatigue, weakness and a sore throat. This condition is treated through drinking plenty of fluids and getting bed rest. In severe cases, corticosteroids may be used. Normally, it takes several weeks or months for mononucleosis to clear up. Leukemia is a kind of cancer that affects your white blood cells. Often, the first symptoms that people experience are frequent infections, sore throats and swollen glands. You may experience abdominal pain, unexplained weight loss, joint pain and easy bruising. Treatment typically includes radiation and chemotherapy. HIV is spread through sexual contact, contaminated blood and the exchange of bodily fluids. Once someone contracts HIV, it attacks the immune system, which makes it harder for your body to fight off an infection. Your lymph nodes may swell, and you may experience other symptoms. Common symptoms include rashes, sores in the mouth, aching muscles, fatigue and headaches. There is no cure for HIV, but antiviral medications can help to control the disease. If it progresses to AIDS, it can be fatal. This is a type of cancer that targets the lymph nodes before spreading to organs like the bone marrow and spleen. Initially, you may feel ill and have fatigue or swollen, painful glands. You may also experience unexplained weight loss, itchiness, chills, fever and night sweats. Treatment for this condition includes radiation and chemotherapy. Sometimes, stem cell transplants are also used. This is another type of cancer that affects your lymph nodes. It occurs in people who already have immune system issues. You can experience symptoms like shortness of breath, coughing, seizures, a distended abdomen, personality changes, problems concentrating and abdominal pain. It is treated with radiation and chemotherapy. You may also be given a stem cell transplant or a blood transfusion to replace your platelets. While your sore throat, swollen glands and no fever may not be a problem, it could be a sign of a serious condition. You should go to your doctor if you have a hard knot in the swollen gland. Get immediate medical care if you have a fever, unexplained weight loss or night sweats. You should go to the doctor if the swelling affects your ability to breath or does not go away in a few weeks. If the glands are tender or red, go to your doctor. Once at the doctor’s office, your doctor will first see if there is a virus or bacteria causing your condition. If these causes are ruled out, they may want to do a biopsy to check for other potential causes. They will treat you based on your diagnosis.